In Road Kill (US)Charlie Fox becomes involved in an investigation centring upon a motorcycle gang in the Lakes after her close friend is laid up in hospital following a bad motorbike accident. Her suspicions about the crash arise when she finds she was on the back of another bloke’s bike rather than her husband’s and when her friend mentions a white van that seemed to come for them. Right from the beginning she’s faced with conflict. She’s at odds with her father who sees her military and close protection career as a complete failure when compared to the family’s middle-class ambitions; there’s her relationship with Sean, her boss and ex-lover for whom she longs and yet fears getting close to; there’s an Irish thug who has his fingers in unpleasant pies; there’s the bike gang whom she wants to get to join so that she can find out what the hell’s been going on; there’s her friend’s son who needs her to keep him safe yet wants her as far away as possible from him and his mates; and there’s the policeman who has her taped but also has a soft spot for her. The zest for the pursuit of the facts as a reader is sharpened by the fact that Charlie and Sean, working together with their smouldering chemistry, don’t have a lot to go on. The evidence they find is often ambiguous and their confusion keeps the suspense at a high level. In the end, it’s a trip to Ireland that opens things up in more ways than one. Throw in the adrenalin created by the bike rides, the satisfaction of following such a top heroine, the violence and the sense of threat and you have a very full and satisfying story. Lots of fun if you like your kindle journeys to be turbulent and gripping. Brazzaville Beach is a tremendous novel. Right from the beginning it has the feel of something rather unusual and for me there was a definite double-take moment when I realised I’d found my place. It’s centred around 2 main aspects of Hope Clearwater’s life, her time with her husband in the UK and her time without in Africa. The drive of the plot centres around Hope’s work observing chimpanzees in the world’s leading scientific project on the subject of the animals. She’s cottoned on to the fact that strange things are happening within her community of chimps that have taken themselves away from the main group. The chimps from the north are sending patrols into the southern territories and this is the cause for a lot of interest. Unfortunately for her, the more she finds out, the more she realises that her discoveries are contrary to the theories of her eminent bosses and it seems that they’ll go to any length to suppress her findings. Weaving in and out of this African scene is her background and her relationship with her very driven husband who is a gifted mathematician. He’s obsessed by seeing things in different ways and interprets things with numbers and visual patterns. It’s a background that helps to explain Hope’s current situation and thinking, while providing a hugely interesting story in itself. It’s quite addictive, which is quite often the case for me when reading his books. There’s the wonderful detail in the characters and settings and he’s a bit like Hope’s husband in the way he can present what is commonplace in new ways that make it a pleasure to get to know people and place. There are the asides that show a tremendous knowledge in a vast range of areas (or at least they seem to) that are interesting in themselves, but are also very relevant and helpful as part of a gentle analysis. There’s the African setting, clearly understood and alive with the exotic. I loved it. I feel like I’ve had a good workout and a huge amount of entertainment. The sad thing is, I was reading a signed, hard-back, 1990 first edition and it’s borrowed from a friend. I’d so like to keep it on my shelves and have considered a few ways of explaining its loss (the cat ate it and the like), but it never worked on my teachers and I don’t suppose my conscience could take it these days. A super story that you should check out. I have a number of positive aspects to my character and a number of negative ones. Some parts of me have a foot in each camp. On the negative side (and there may be positives to this too), I'm impetuous, disorganised, a bit dyslexic, a little daft and have a heap of OCD (meaning many of my thoughts, once realised, just won’t leave me alone). What I’m trying to explain is the reason behind this competition. I have to miss the Bloody Scotland Crime Fiction Festival because my wife and eldest child are going to the top of Ben Nevis and have booked trains and accommodation. I was there last year and loved every minute. It was on the calendar downstairs, and even though I could have gone to look at it, I couldn’t get away from the Bloody Scotland programme. I also thought of interrupting my wife who was reading a story to the kids and in a bit of a bad mood, but I couldn’t hold on, not even for 5 minutes. That’s a curse. The result is that I have tickets I can’t use (I only got to booking a few before my wife emerged from the room only 10 feet away) and broke the news. A couple of them were free. I have 2 tickets for the Radio Four Short Stories, Saturday September 14th at 1.30pm with Stuart MacBride, Ann Cleeves and Malcolm MacKay. I’ve been to radio recordings in Edinburgh and Hay and they’re wonderful things to be part of. The other is for Arne Dahl on Saturday 14th September at 11.45 am. That cost £9. It’ll be a sad miss. I did consider taking my 5 and 7 year-old children in, but can just imagine the scornful looks of the audience as Mr MacBride described something rather macabre. I’m not sure I’d feel too good about them hearing it either. (Ear muffs?). I have no idea about the terms and conditions on the tickets (I could check, but that’s not really my nature, though I can hear the voice saying ‘it’ll only take a minute’). So, to the chase at last. They relate to a couple of my books. a) In the novella Smoke, what Kind of car has Jimmy’s father been restoring? b) In Mr Suit, what colour is Archie’s canal boat? I figure that it’s a good way to reward people who follow my work and a way to try and persuade people who might be interested but haven’t yet taken the leap to buy a copy. How about 21st July as a deadline? From there, correct answers will go into a hat. Before I go, I’m just going to mention that, though I’m upset that I’ll be missing these particular events, I’m more upset that I shan’t be touching base with some of the amazing people who’ll be there as participants and spectators. If you didn’t make it last year, I can heartily recommend it. I’m also going to mention that it seems odd that I’m not saying ‘answers on a postcard to...’ How old do I feel? ps If the team at Bloody Scotland anounce a creche, I may just have to answer the questions myself and take my chances. pps if there are no entries, I'll think of a way to help a charity benefit in some way. once created a Black Pulp hero when he was a kid. “I used to used to draw my own character called Sea God,” Nas told me. bugged adventures of urban champions. wanted to create a hood hero. requested to illustrate the first Star Wars comic book. search of a music minded kidnapper. was still on the verge exploding. 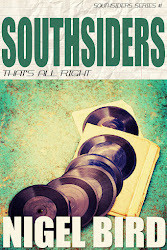 to rid b-boys and their music from the streets of Sugar Hill. and writing, “Jaguar and the Jungleland Boogie” was finally finished. Kimberly Richardson, Mel Odom and others. A quick plug. Mr Suit (US $3.79) is now down to the price of £2.99 for the paperback. Here's the link. Now, far more importanlty, here are some thoughts on Mulliner Nights. Here’s a book that glitters. It sparkles with humour and the quality of writing and the pure pleasure that comes across in the telling of this collection of tales. Mulliner hangs about in The Angler’s Rest chewing the fat, only there is no fat in the book, rather it’s all lean meat. Whatever the subject, Mulliner can relate a tale of one of his relatives who has experienced something similar. There are common threads that possibly relate to the gene pool: the wooing of a ladies, sturdy butlers, gentry, a slightly dizzying ineptitude, swirling messes and genius solutions. As the blurb says, there are a range of subjects covered. Each of them seems rather implausible, but as soon as the tales begin they live and breathe like the best of them. Reading these stories is as close to pure joy as you’ll find in a book. The humour drips from the situations and the characters so that I doubt there are many who could read them with a straight face or, indeed, without blurting out the odd titter. Wodehouse can bring a smile simply through his choice of a name. The sharp wit and repartee is ever present. The simile is raised to the level of art. What is particularly pleasing is the way it feels like the author could sit at a typewriter all day, day after day, and produce page after page of the most perfect prose as easily as he might breathe or eat strawberries. If there are faults in this one, I can’t find them and I don’t really care. Spot them and please don’t bother to point them out to this reviewer as I would rather keep the memory of pure pleasure with me for as long as I can. Chapter 8. Strychnine In The Soup. 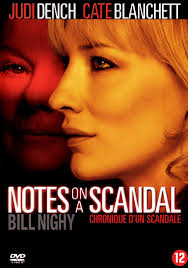 In the film 'Notes On A Scandal', Sheba Hart (Cate Blanchette) is a beautiful teacher who arrives to work in a secondary school early on in her career. She immediately incurs the suspicion of Barbara Covett (Dame Judi Dench), a rather long in the tooth battle-axe who isn’t far from retirement. Barbara tells the story via her regular diary entries. At the beginning, they’re nothing out of the ordinary, but as the plot unfolds a sinister, bitter undertone is slowly revealed. Sheba and Barbara become friends. It’s a relationship that is to become extremely twisted given Barbara’s unhealthy motives. As their friendship grows, Barbara soon manages to worm her way into Sheba’s family life and begins to sense feelings in her friend that might not actually be there. When Barbara discovers that a Sheba is having a sexual relationship with an under-age pupil, things heat up and the plot thickens nicely. I really enjoyed this flick. The setting had me feeling nostalgia for my own North London days, but it also had me thinking of older films, often French noir – very unsettling, slightly claustrophobic, tense and complex. It’s all helped by some extremely good performances by all. The two main characters are extremely well played and caused my loyalties to split as morals melted and blurred along the way. There’s a creepy tension to the plot and a real sense of the pain of the two women from their very different perspectives that makes this well worth a watch. A great way to spend a Saturday night. A Healthy Fear Of Man (US) is the second in a series of Paul Little books. I must confess to have skipped the first, but that puts me in the position of being able to highly recommend this book whether you read ‘The Science Of Paul’ or not. This book has very strong legs and can definitely stand alone. PAUL LITTLE has inherited his grandfather’s house and land and is living in it as a total outcast. When visitors arrive, he does his best to shun them no matter what their intentions. There’s a little girl (GILLY) who want to fish in his pond, there’s a young African lady (LUISA) who wants to give him free meals from the church and there’s an old-timer and ex-sheriff (BO). He does his best to keep them away, but for various reasons they refuse to listen. The good news for Paul is that he’s finally coming close to finding peace in his life, even if that means barely surviving from what he can eat from the land and has lost any real need to keep his personal hygiene routines up to scratch. The bad news is that Gilly is found dead in his pond one morning and he’s the main suspect, predominantly because he’s black and living in a backward county in North Carolina. Bo, indebted to Paul’s grandfather for saving his life way back, joins Paul in his attempt to clear his name and Louisa has a big heart that means she can’t help but join the team. What follows is a series of brutal encounters as corrupt politicians, vengeful brothers, loose policemen and wild drug dealers are all sucked into the action as Paul stirs up the muddy waters. I really enjoyed this book. It’s thought provoking and gripping at the same time. 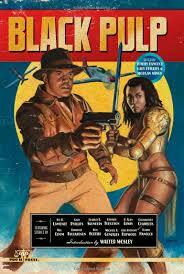 Aaron Philip Clark can really handle plot and back up his ideas with well-written action sequences. As the novel plays out, he keeps a steady hand and right through to the end. Unfortunately for Paul, he’s all too human. Isolation isn’t going to work because people aren’t going to leave him alone. This means he forms attachments to people and develops feelings for them in spite of his intentions. As soon as these feelings take root, he is returned to the complications of social existence With these building relationships come responsibilities, so when Paul tries to find out who killed Gilly, he is eventually more motivated by finding the murderer for her rather for the sake of his freedom. 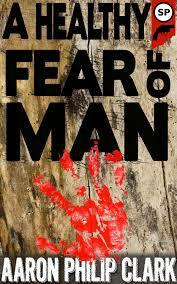 A Healthy Fear Of Man is a serious book that’s a hell of a lot of fun to read. If Paul Little is being invisible, can he still have an impact upon a society where justice is multi-faceted, the law is corrupt, where people are struggling to get by and where racism is prevalent? The biggest message in the book, the way I see it, is to all of us. Should we go about congratulating ourselves on the progress the world has made over the years? Has racism been put to bed so that the world lives together as one happy family? In nations where laws are set and seem equal on the surface, is this equality carried through in all pockets of that nation? Of course not. We need to be vigilant, active and avoid complacency. Take me, for example. I write about a black author and cite Ellison - is that something I need to check myself for (I still think that cap fits, though, and maybe you could let me know). The book points a finger at the Southern States of the US and challenges them to find out whether the New South with all of the rosy connotations, isn’t just the Old South with a flaking coat of paint. Which is where I find myself going out of my depth. It’s a great book. One to be enjoyed and to be considered. Very good indeed. If you’re the author of a well-loved character and that character has aged along with his or her fans, how can a new story idea be effectively written? The idea of James Bond limping around with a Zimmer frame and needing the toilet every half an hour isn’t immediately appealing. Over the last year, I’ve read 3 books that have taken on this problem by writing from the point of view of the protagonist introducing a story, then retelling it as if it were just another book in the series. George Pelecanos did it with ‘What It Was’, Reed Farrel Coleman in ‘Onion Street’ and Lawrence Block in ‘A Drop Of The Hard Stuff’. I must say that in all these instances, the result has been a delight and so the method must work. 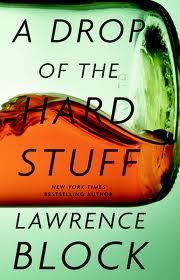 I must confess that when I read the first few pages of ‘A Drop Of The Hard Stuff’ I had a slightly negative reaction. The preface seemed a little clunky and contrived and I wondered if Mr Block had finally written a Scudder novel that I wasn’t going to enjoy. That’s a huge thing to say and I want to berate myself already for typing those words. It’s a simple thing to correct the error of my ways, however, as the book took off as soon as the story proper began. Matt Scudder hooks up with a man he used to know (High-Low Jack) when they grew up together in the Bronx. In part it has that feel of an old movie where 2 men take very different ways (think O’Brien’s priest to Cagney’s gangster). They grew up on the same side of the tracks, but somehow ended up on different trains. A number of years later their paths cross at an AA meeting. It turns out that Jack is much further advanced in the AA programme than Matt; Matt is about to complete his first year sober and Jack is already at the ninth-step of the famous twelve-step program. Being at the twelfth step means that High-Low Jack is working on making amends, seeking out those he’s harmed over the years and apologising. It turns out that Jack has been in prison and has led the life of a low-life. He’s got a lot to make up for, including a murder. Unfortunately, while trying to put the world to rights Jack ends up scaring someone into killing him. Jack’s sponsor, a step-Nazi, feels responsible for the death and asks Matt to investigate. 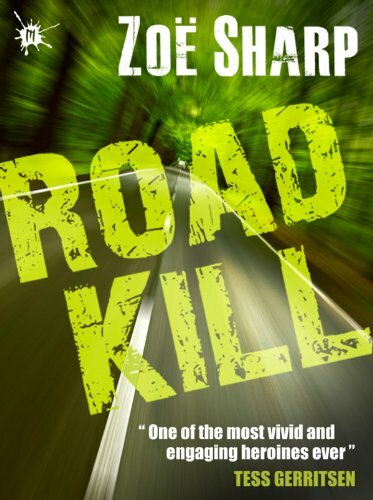 The story unfolds with the usual ease, like Mr Block has simply pushed cruise control. 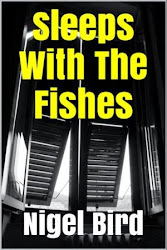 The writing is smooth, the hooks sharp and catching and the story utterly captivating. 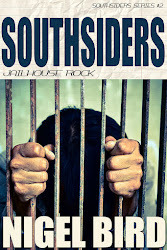 As with all Matt Scudder books, the case itself is only half of the story. The other half is Scudder’s day to day life and his thought processes. In this book, much of the focus is upon the ups and downs of a reformed alcoholic. Booze features heavily in the book in a variety of ways and I found this aspect of the novel really interesting. 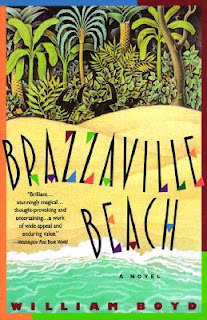 There’s a line-up of brilliantly written characters, including some old favourites, there’s a love interest or 2 and there’s the usual fun and games with word-play. My early worries were completely unfounded. It’s a special book. I’d recommend it to all Scudder fans (though I don’t think they’ll need telling), to all fans of detective fiction and to anyone who loves a strong story or wants to have a very real sense of where a book is set. I’d also suggest that this would be a good place to start if you’re thinking of meeting Matt Scudder. 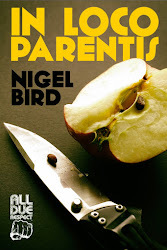 I think it would leave you hungry for more and looking for the first of the Scudder (‘The Sins Of The Fathers’) books and every one since.